Normally, the thought of dried food does not bring to mind a gourmet meal. However, a relatively small amount of sun-dried tomatoes gives a gourmet touch and a burst of flavor to a variety of recipes. Easy to make, store, and use at home, this is an item you may wish to consider a staple in your pantry. During the drying process tomatoes can lose anywhere from 88 to 93% of their original weight, talk about water retention! Italians have been sun drying tomatoes on their ceramic rooftops for centuries as a way to store tomatoes for the winter months. This is also why so many Italian recipes call for sun-dried tomatoes. Italians weren't the only ones who stored tomatoes this way. The Aztecs were also using salt and the sun to help dry and cure this produce for the offseason. Although prices of store-bought sun-dried tomatoes have come down in recent years, it's still worthwhile to make your own at home, particularly if you have a tomato garden. The basic process is easy enough. Most prefer to begin with Roma tomatoes, as they have fewer seeds and a higher ratio of flesh, but you can use any type of tomato, including cherry varieties. No matter which variety you choose it's best to choose tomatoes of a uniform size so they dry at the same rate. Simply slice tomatoes in half, place on a raised screen, lightly sprinkle with salt and place in the hot sun until dry. Depending on your weather conditions, this could take anywhere from four days to two weeks. You'll want to cover them with cheesecloth, raised so it does not touch the tomatoes, to keep out any critters and provide proper ventilation. You will also need to bring them in during the night, lest the evening dew undoes your drying process. Plan on 10 standard tomatoes to get one ounce of dried tomatoes. If the old-fashioned method sounds too time-consuming or you live in an area with few sunny days, you'll be happy to know you can achieve the same lusty results with an oven method or a dehydrator in a fraction of the time. While dehydrated food does keep far longer it can still spoil. Your sun-dried tomatoes should last up to seven months when stored under proper conditions. The end product of sun-dried tomatoes must be perfectly dry but not crispy, with no inner moisture in order to avoid bacteria growth. Oil-packed sun-dried tomatoes with fresh herbs or garlic added must be refrigerated after opening. 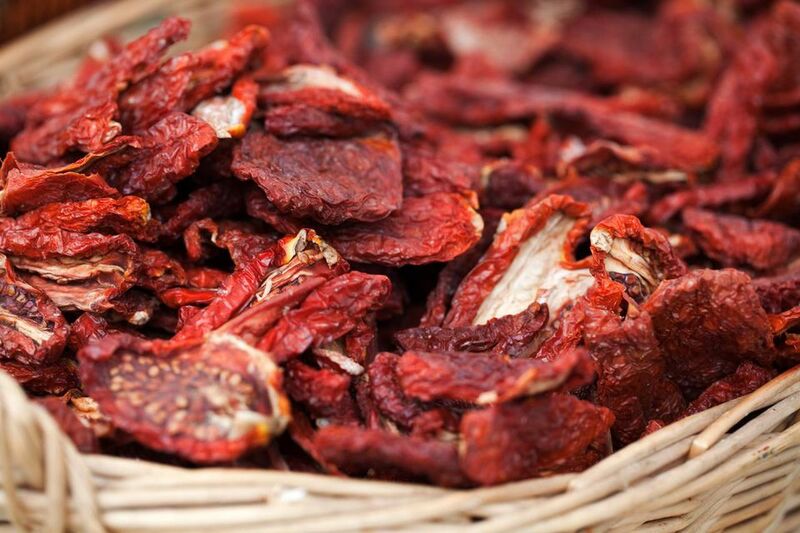 Do not eat sun-dried tomatoes with signs of rot or mold.